Pace bowler James Anderson has been recalled to the England one-day squad to face Scotland in Aberdeen on 9 May. Peter Moores is back in charge of England for a second time after succeeding Andy Flower as head coach. 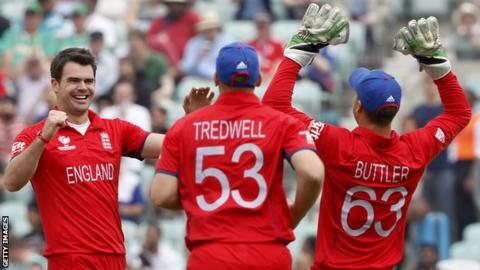 Anderson, 31, was rested for the limited-overs series in Australia that followed the 5-0 winter Ashes defeat. Uncapped Nottinghamshire left-arm seamer Harry Gurney, who toured the West Indies but did not play, has been included in the 13-man squad. England Twenty20 captain Stuart Broad is sidelined by a knee injury, while Tim Bresnan has not played for Yorkshire this season following back trouble. Fellow pace bowler Steven Finn, who left the Ashes tour early, is overlooked despite his impressive form for Middlesex this summer. National selector James Whitaker, who took over from Geoff Miller in January, said Finn would be monitored before the summer Test series against Sri Lanka and India. "Steven Finn is bowling very fast and effectively in county cricket, but our policy has been to give him as much confidence as possible at county level," he said. "Once the Test series starts, we can review where Steven is at. We know he will come back, but let's make the decision at the time." Alastair Cook will captain the team, with batsman Joe Root returning after missing the World Twenty20 with a thumb injury. All-rounder Ben Stokes continues his recovery from a broken wrist sustained when he punched a locker during the West Indies tour. Opening batsman Michael Lumb misses out despite making a century on his ODI debut against West Indies in February. England face Scotland before the limited-overs series against Sri Lanka starts with a T20 international at The Oval on 20 May. Earlier on Thursday, Graham Gooch left his role as England batting coach, the latest in a series of changes to the coaching and management set-up. Moores took over following Flower's resignation as team director, while Nottinghamshire director of cricket Mick Newell and Middlesex counterpart Angus Fraser joined the selection panel. Alastair Cook (Essex, captain), Moeen Ali (Worcestershire), James Anderson (Lancashire), Gary Ballance (Yorkshire), Ian Bell (Warwickshire), Ravi Bopara (Essex), Jos Buttler (Lancashire), Harry Gurney (Nottinghamshire), Chris Jordan (Sussex), Eoin Morgan (Middlesex), Joe Root (Yorkshire), James Tredwell (Kent), Chris Woakes (Warwickshire).